In 1997, young air force lieutenant Gan Siow Huang declared in a recruitment advertorial printed in this newspaper that women can contribute to national defence. With modern technology, "it is no longer brawn that matters", said the 24-year-old, who had in 1993 been among the first four women to be named Singapore Armed Forces (SAF) Merit Scholarship winners, breaking the male stranglehold on such awards. It seemed like a bold statement for a young woman lieutenant to make at a time when the Ministry of Defence (Mindef) was absorbing women into combat vocations, only to have them perform logistics, supply and support functions. Mindef's position then was that women could be posted to places where there was a conflict but they could not be exposed to front-line duty. But Ms Gan, then a junior command, control and communication (C3) officer, and her fellow women contemporaries would go on to surpass those limits. 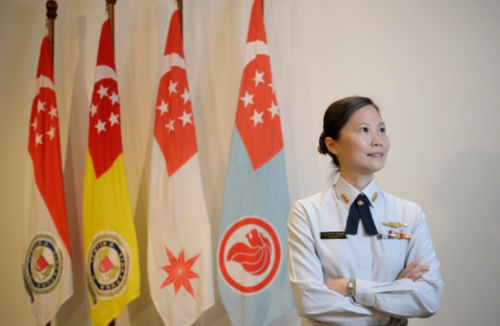 Over the next two decades, Ms Gan would not only draft policies but also command the Republic of Singapore Air Force's (RSAF) 203 Squadron and the Air Surveillance and Control Group, before becoming the SAF's chief recruiter. Yesterday, the 40-year-old head of SAF's joint manpower department became the first woman in the armed forces to assume the rank of a brigadier- general. She will soon take over as the RSAF's head of air intelligence and director (special projects). News about BG Gan's promotion has drawn two types of reactions. First, people have called her promotion historic and hailed her for cracking the proverbial "brass ceiling". Then, there are others who ask: Why only now? While it is fitting to celebrate the strides women have made within the SAF, BG Gan's gender is not the only or most important aspect of her quiet, determined climb into the SAF's upper echelons. She is an officer of proven strengths and merit who, as Defence Minister Ng Eng Hen put it, just "happens to be a woman". Today, women comprise about 7 per cent of the SAF's pool of regulars. According to Mindef's figures in 2013, about a third of the 60 women who sign on with the SAF every year receive study awards and scholarships for their tertiary studies, putting them on track to be groomed as leaders and commanders. In contrast, women make up 14 per cent of the United States military and more than 10 per cent of the Australian Defence Force. With BG Gan's entry into the SAF's rarefied ranks of 20-plus generals and admirals, women's share of top leadership positions now stands at about 4 per cent. That is similar to the share in the Australian Defence Force. By comparison, about 7 per cent of generals and admirals in the US military are female, with three four-star generals on active duty. In South-east Asian militaries, only the Philippines army has appointed a woman general. That was in 2011 but she left the uniformed service two years later to enter politics. BG Gan, who has a degree from the London School of Economics and a Master of Business Administration from Massachusetts Institute of Technology, has proven that a woman's career progression is not hampered in a male-dominated workplace like the SAF. Backed by strong support from her family, bosses and colleagues, the mother of three has trumped some male peers to reach the top. Ask BG Gan how she did it and she says in her calm and cheerful way that going to work "is a bonus" as she loves her job and rises to the challenges given to her. Indeed, those who know or have previously worked with her have no doubts that she rose through the ranks on her own merit, without putting on any tough-girl bravado. They have described BG Gan as a "one-of-a-kind professional" and "go-getter with unrelenting work ethic" who, at the same time, takes care of the men and women under her charge. If the military grapevine is to be believed, the former commander once doled out cookies to her tired subordinates the morning after an overnight training exercise. To be sure, other women officers have, like BG Gan, maintained that they did not encounter any discrimination. Dr Ng, in his SAF Day interview last Friday, also stressed that the Singapore Armed Forces promotes based on merit and that "there has never been a ceiling". "If you are able, you will rise to the top because we need you... We don't look at the gender nor the race." This policy of gender equity has been in place since Mindef opened the SAF Merit Scholarship to women in 1992. Acknowledging the potential of an untapped talent pool, Mindef aimed to attract the best of Singapore's young women and to groom them to hold top posts. Asked about their prospects, Mindef's Deputy Secretary (Administration) Dileep Nair said then: "We would expect these women to go practically to the very top. Just exclude the Chief of Defence Force, the service chiefs and chief of staff. Posts below these are open." Today, women are flying F-16 fighter jets and have broken into male-dominated elite front-line combat units like the Guards Formation and Naval Diving Unit. There are also those who are at the helm of warships, and ground and air units. For instance, one of the commanding officers of the navy's stealth frigates is SAF Senior Lieutenant-Colonel Jerica Goh. The senior officer, who is likely to be bumped up at least one more rank to colonel in the future, was, like BG Gan, one of the first four women scholarship award winners in 1993. Among younger cohorts, infantry officer Sharon Tan made a breakthrough in 2010 when she beat fierce competition to be the first woman to receive not only the prestigious SAF Overseas Scholarship but also the President's Scholarship. But having a handful of women trailblazers may not be enough to meet the SAF's manpower needs, more so when the current number of males enlisted is likely to shrink by a third to 15,000 a year in future. Adding more women will boost the ranks and ensure that the SAF can still mobilise about 300,000 soldiers from regulars, full-time national servicemen and operationally ready NSmen. This is a reality that is not lost on navy chief Lai Chung Han, as he aims to double the number of women sailors in the next 10 to 15 years. This, he said, will require not only family-friendly policies but also mindset changes. In a recent media interview, Rear-Admiral Lai said: "If you look at our numbers, going forward if we don't recruit more women, we can't man all our positions...the choice is simple - you either have that post not filled, or you have a woman who comes in, serves effectively for 20 to 25 years but is away for maternity every now and then." He stressed that "women also bring great value, especially in an advanced armed forces where technology is key - where there's less heavy lifting, physical strength, but (more of) mental strength, leadership, character and values". By virtue of the fact that men form the majority of SAF regulars, the likelihood of a woman making it to the top ranks is unsurprisingly lower than for her male counterparts. Military promotions tend to be highly structured and officers have to serve a series of appointments in order to move up the ranks. "These appointments have to be served in a particular order as they build upon the experience earned in earlier ones. One cannot be parachuted into senior appointments," defence analyst Ho Shu Huang pointed out. Officers also "need to be consistently good across ranks, across their careers", said Mr Ho, an associate research fellow at the S. Rajaratnam School of International Studies at Nanyang Technological University. He added that the SAF is likelyto get more senior women officers if it recruits and retains more women. And in BG Gan, the SAF has found a respected "poster girl" for its big push to persuade more women to give a career in the uniformed services a shot.